On September 29 I reported that Mark Elliott and Chany Sabates at International Yacht Collection had signed a joint central agency for sale of Westport's 34.6m motor yacht Imagine. 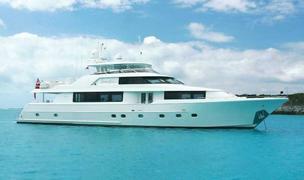 Now a call to Mark confirms that she's just been sold, with Tom George at Tom George Yacht Group acting for the buyer. Delivered at the end of December 2007, this was the first time she’s been offered for sale and is ‘in pristine condition.’ Sleeping eight guests in four staterooms, her shallow draught makes her ideal for cruising in the Bahamas and the seller was expecting delivery of a new 50m Trinity this Spring. Imagine was asking $8.65 million.